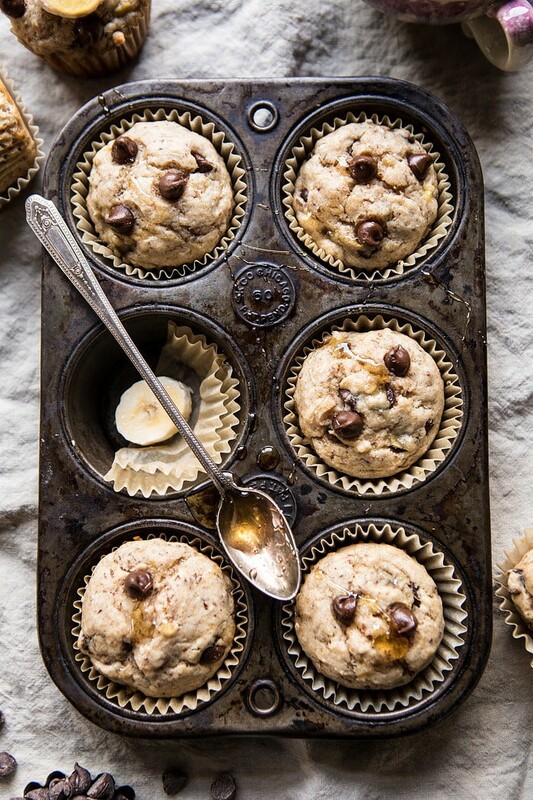 Friday is calling for these Vegan Whole Wheat Chocolate Chip Banana Bread Muffins. 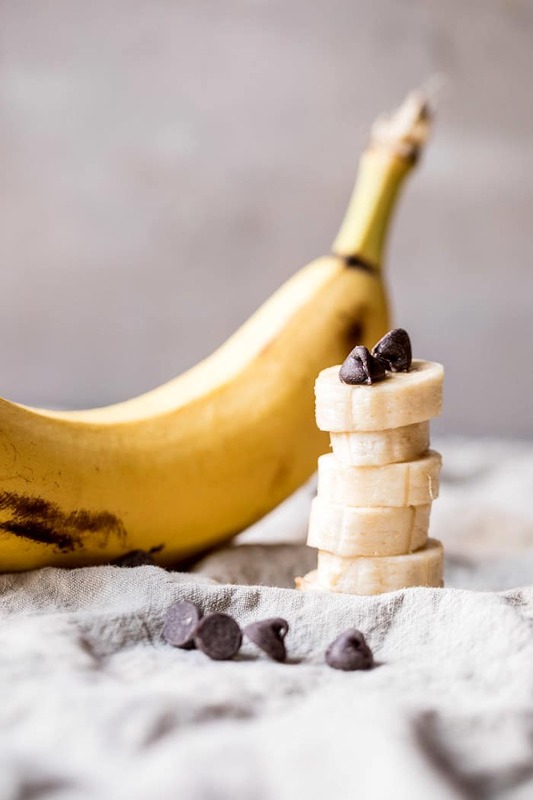 Because everyone needs a little chocolate with their bananas. It’s true! Also very true? Chocolate is a must at the end of a long week…or just long days for that matter. This past week was filled with so many things. A lot of time was spent in the kitchen, and a lot of time was spent planning out the final details of the Studio Barn, which I am so excited about. Can I just say that the new studio kitchen is going to be insanely gorgeous. I’m the most exited I’ve ever been and so incredibly grateful for our amazing designers over at Park and Oak Design. They have done incredible things with the space and I cannot wait to show you guys soon…ish. We are hoping/praying/crossing our fingers that the space will be complete by the end of February. We have a big shoot planned that I’m pretty excited about, but as with most construction projects there have been set backs, headaches, and workers that don’t show up until noon and leave at four. So we are running around like crazy people, trying to get everything done. And when I say we, I really mean my mom, Jen, aka HBH’s other half (literally) who has taken lead on the studio project. We spent the week going back and forth on finalizing doors, sink faucets, lighting, and all the details. Oh, and then we completely changed our plans for the kitchen sink…at the very last-minute, which of course was my doing…typical. I have to say though, I’m so excited about what we now have planned for the kitchen sink. It’s going to be gorgeous. We all had our hands in a lot of different projects this week, so I’m hoping for a more chill weekend. 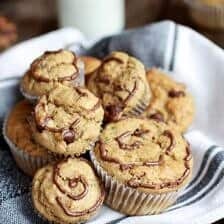 That probably will not happen since I don’t know how to actually chill, but hey, at least I have chocolate chip banana muffins to sink my teeth into when a break is needed. Speaking of muffins, I should probably stop rambling on and move on to chatting with you all about these muffins. Because these muffins? These VEGAN, WHOLE WHEAT, muffins? They are really good. Pretty sure you guys know this by now, but I really love banana bread. I think I now have three banana bread recipes up on HBH? 7 Ingredient Ricotta Banana Bread. Since I love banana bread so much, I thought it was time to add a banana bread muffin to the line-up. 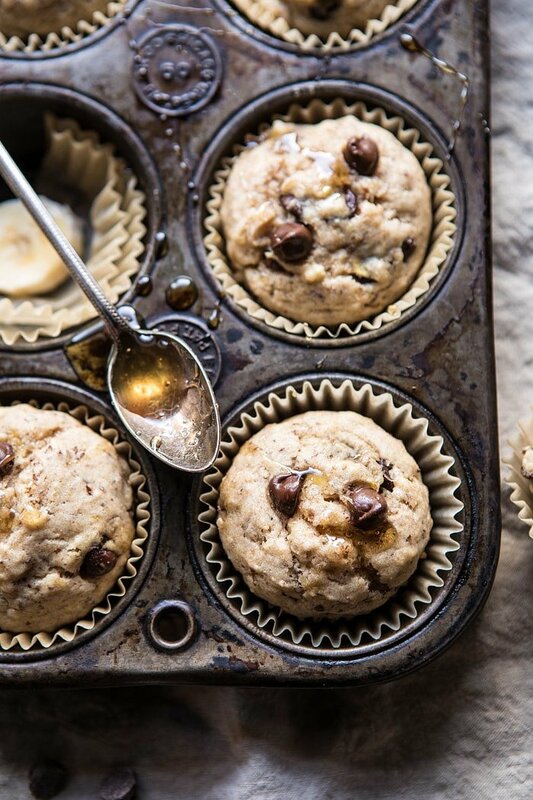 Enter these vegan whole wheat chocolate banana bread muffins. 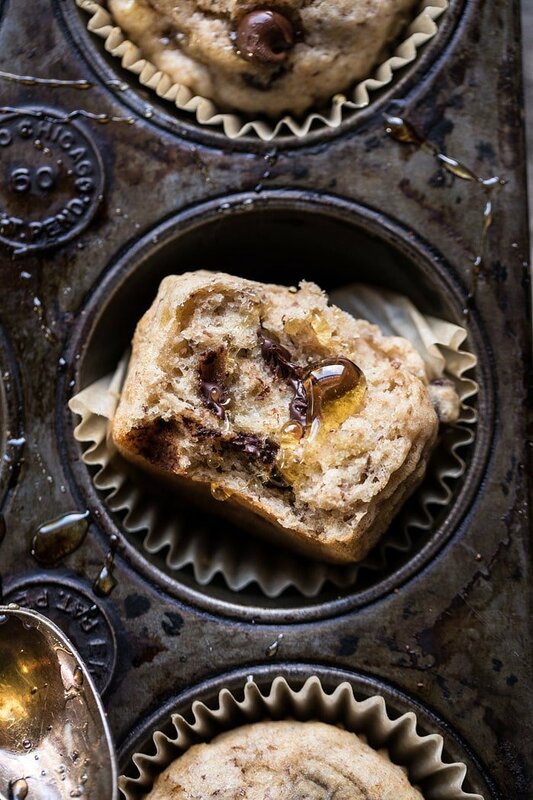 These muffins are light, moist, filled with banana flavor, and generously studded with dark chocolate chips. Oddly they’re also vegan, which you guys know I don’t often do many vegan recipes, but I wanted to try something new and was so very happy with how these turned out. 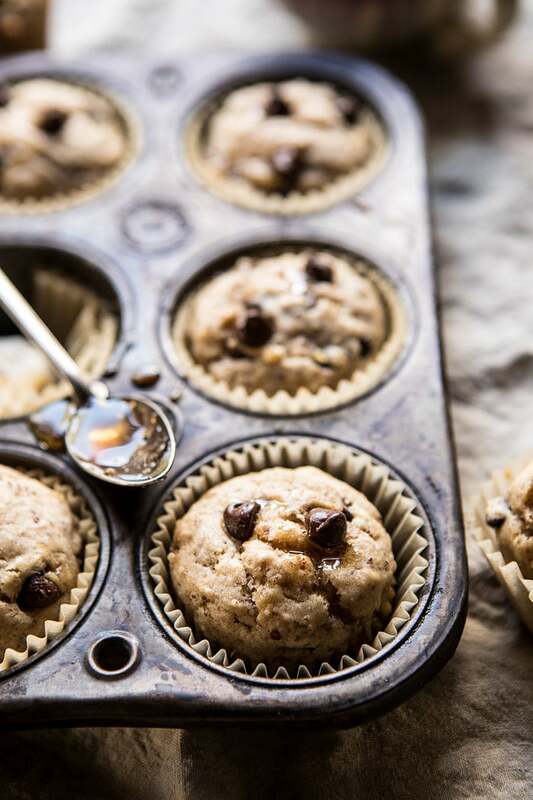 The key is to incorporate a flax “egg” into the batter to keep the muffins moist. A flax egg is simply just ground flax seeds mixed with a little water. The flax seeds absorb the water and turn to an egg-like consistency. If you’re new to vegan baking you will think this is weird, but just have some confidence in me. I promise all will be good. The other secret? 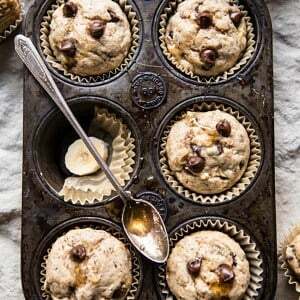 Using really, really ripe bananas. The bananas in the photo above? They’re not ripe enough in the least. I just forgot to take photos of my brown bananas before baking with them, I am sorry. I swear that the bananas I used were very brown. Use brown bananas guys, BROWN. It’s OK if they have some bruises. It’s OK if they feel super mushy. Overly ripe bananas will give you the best banana bread, whether vegan or not. Always. It’s also important to use really good dark chocolate chips. Make sure they are vegan if this is of importance to you. Not going to lie, mine are not, but hey, they are 72% cacao, so that’s close enough for me. I recommend eating these warm outta of the oven, with a drizzle of honey (or more maple if you’re 100% vegan) as a little night-time treat. It’s perfection with every bite…and just what your weekend needs! 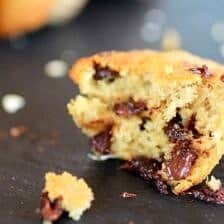 These muffins are light, moist, filled with banana flavor, and generously studded with dark chocolate chips! 2. In a small bowl, combine the ground flaxseeds with 1/3 cup water. Let sit 5 minutes or until thickened. 3. In a large mixing bowl, stir together the mashed bananas, coconut oil, maple syrup, almond milk, and vanilla, mix until combined. Add the flaxseed mixture, stirring to combine. Add the flour, baking powder, and salt, mix until just combined. Fold in the chocolate chips. 4. Divide the batter evenly among the prepared muffins tins. Transfer to the oven and bake for 18-20 minutes or until a toothpick inserted into the center comes out clean. Enjoy...preferably while warm, with a drizzle of honey. YUM. Bananas and chocolate. The best. Happy Friday! Whole Wheat Spinach and Artichoke Pizza + Video. These look great. Do you think I can bake it as a bread instead, like in a 5×9? These look so incredibly delicious. I love that they use 100% whole wheat flour. I definitely want to make them soon. And I’m excited to see your new studio barn once it’s complete, especially the kitchen. I’m sure it’ll be worth it all. If I wanted to use egg instead of flax, would one egg be sufficient? These sound amazing!! Can’t wait to try them! I love that you offer some vegetarian/vegan options too. My daughter is vegan so it is nice to have some things to try when she comes home to visit. But I don’t think I will wait for her to try these!! Ha ha! Thanks for all you do, your recipes are all amazing! P.S. Can’t wait to cheer on your brother in the Olympics! I hope you and your daughter love these muffins, Susan! Thank you! Always a favorite flavor combination of mine. These look incredible! 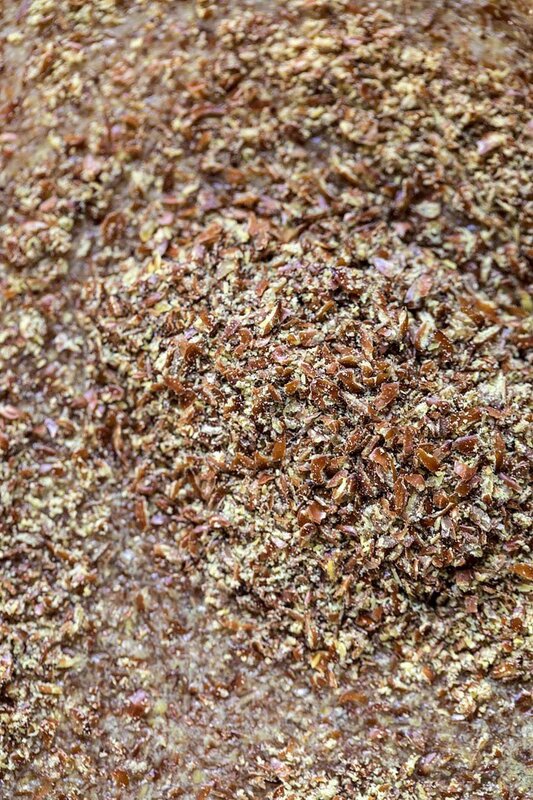 Can ground flax seed replace the flaxseed meal? Excited to try these! HI! They are actually the same thing, so yes! 🙂 Please let me know if you have other questions. Hope you love this recipe! Thanks! I love muffins so much! Right?! They’re the best! Thank you Jennifer! WOW! These have my name written all over them! Wish I was eating one right now! So excited to see your new space Tieghan! I’m sure it will be totally amazing. Love these muffins. Gotta have chocolate with my bananas! 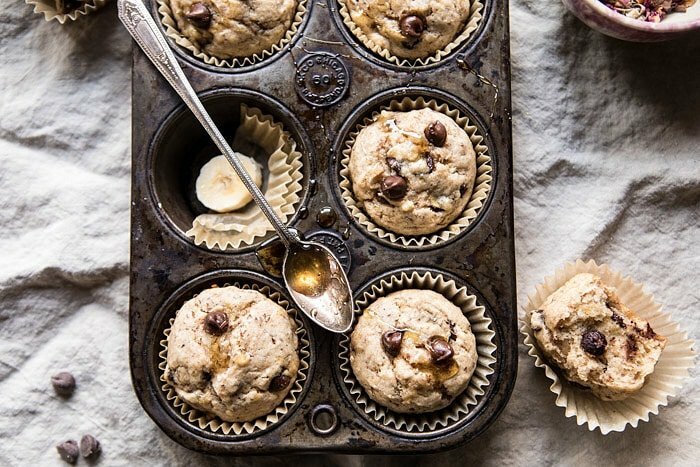 I love these whole wheat banana muffins! 🙂 The whole wheat muffins sound lovely fresh out of the oven with some honey, or in the morning with some coffee. I’m so excited to see the studio barn! I’m sorry it’s been a bit stressful but hopefully it will be done when you want! Can I visit? Haha Please! I’d love to see the final space and finally meet. 🙂 Also, I hope you do have a restful weekend (with muffins in hand) and get to plan more for the Olympics! I’m looking forward to tomorrow’s post and hope you’re staying warm. These are perfect for breakfast to go! 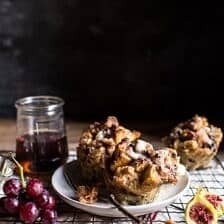 Love a good muffin and these sound delicious! I haven’t made these yet, but I just had to say THANK YOU for putting the measurement of mashed bananas as opposed to only the # of bananas. I mashed and froze my black bananas and for the life of me I couldn’t find a vegan chocolate chip banana muffin recipe that listed the banana measurement! Off to make these, will update my review afterward! So glad you like this recipe and hope you love these! Thank you Erin! I did love them, as did my 2 boys and my hubby! I doubled the recipe and they still came out beautifully. Even better the 2nd day! Thank you!!! That is amazing! Thank you Erin!! My 5yo and I made these today and they are delicious. I am so happy to hear this! Thank you Michelle, I am glad you and your son loved these! You forgot to add the vanilla extract in the instructions and n I bake them they are pools of oil from the coconut oil. Not sure why…? So sorry, the recipe has been fixed. I am not sure about the oil. Did you follow the recipe or change something? Hope I can help problem solve for you. Same, I asked the same question earlier. Might try next time with less or a different type of fat. Have you tried any modifications yet? Thank you very much for this recipe!! Do you know the calorie count for these tasty treats? Hi Cecilie! I actually do not calculate the calories in my recipes, so sorry about this! I find that online food calculators work pretty well though! I hope this helps. Let me know if you have any other questions! I’m curious- can I replace eggs in any recipe with a flax egg? 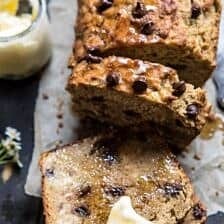 Love this healthy variation in banana bread! I had to use no so great chocolate chips as that’s all I had this time but I’ll get better ones next time! These are amazing! Swapped sunflower oil for coconut oil, and they were delicious. My kids (4 and 2) loved them. Great way to add flaxseed to their diet without them noticing. Thank you! Would I be able to use hemp milk instead of almond milk? Made the muffins and they were excellent! My husband really liked them as well-he didn’t need to know they were vegan😉! My cholesterol is up so I’ve decided to watch what I eat a little better and the muffins were a great place to start. Love your posts and wish I had more time to make everything! I am so glad you both loved these muffins, Tracey! Thank you! Hi I noticed the coconut oil was beginning g to solidify once I started to mix it. Was that supposed to happen? I made these last weekend for a brunch I was attending and they were delicious! I’m not vegan but I’ve been dairy and soy free for a bit now. I preferred them the next day verses right out of the oven which is not normally the case. Either way, I’m a fan! Also liked the flax & water trick for replacing the egg!